When I was 10, I met a new best friend. Alison came from a Doukhobor family, and she had just moved to Kelowna from Grand Forks, a little town nestled in the mountains of the West Kootenays of British Columbia. Doukhobor cooking is, shall we say, not for the faint of heart. The Doukhobors are a pacifist Russian sect who take their anti-violence belief all the way over to not eating meat. But they make up for it with copious amounts of butter and cream. 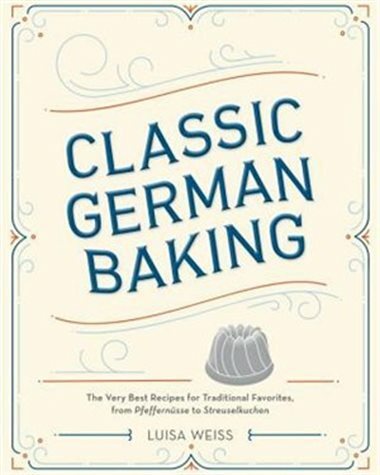 In fact, their cooking is so amazingly rich that Alison and her family convinced me – a Canadian girl from good meat-eating German-Scottish stock – to become vegetarian. Doukhobor food is that good. Alas, as is the way of the world when you’re 10, best friends don’t stay best friends for long. I still dream about the perfect pyrahi – yeasty pockets of dough filled with cottage cheese or peas and drenched with melted butter. And I still make vareniki; think of pierogie-like things, again smothered in butter. 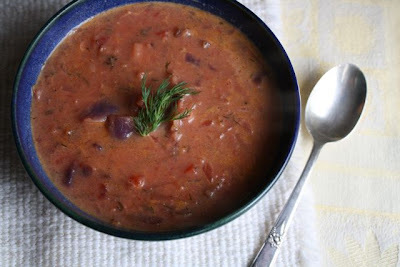 But for a long time, I couldn’t replicate the creamy borscht Alison’s mom made. 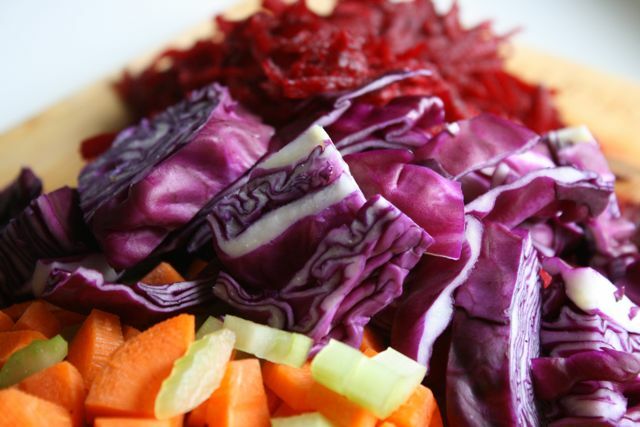 There are so many different kinds (and spellings) of borscht – with white cabbage and beef bones or pork hocks . . . The list goes on. 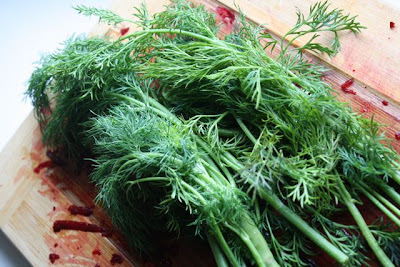 But none of it was the Doukhobor borscht I longed for – I'm talking dill and cabbage and beets and cream. Until one fateful day when I was looking through my parents’ old recipe cards and came across a recipe in my mother’s handwriting for Grand Forks borscht. She had written the name “Bea” on the top. I’m not sure who Bea is – I think she might be my mom’s old teaching friend. The recipe was strange. It called for dill and mashed potatoes and copious amounts of butter and cream, and leaving it out at room temperature over night . . . But it was from Grand Forks. And it called for copious amounts of butter and cream. This, I thought, was a good sign. And it is. This is the soup I have been missing since I was 12. Grand Forks borscht is now a winter standard at our house. The recipe makes enough to feed a small army – invariably, I end up splitting it into two large pots halfway through cooking. But it is so very, very comforting and creamy on a cold rainy day. It’s definitely hearty enough for dinner and perfect in your lunch the next day, or frozen to grace a lunch later on. It might even make you consider becoming a vegetarian. Boil the potatoes in a large soup pot with lots of salted water. When they are tender, use a slotted spoon to scoop them out into another bowl. 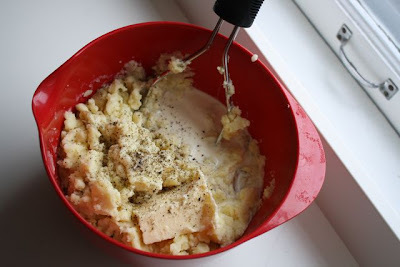 Mash them with 1/2 – 1 c. cream and 1/4 – 1/2 c. butter. Season with salt and pepper. Set aside. Throw the beet, carrots, celery, tomatoes and dill into the potato water and bring to a simmer. After they’ve cooked a few minutes, taste the vegetables and decide if you’d like to add another 1/2 tsp. of salt. Boil until tender. While the vegetables are boiling, heat a large frying pan over medium heat. Melt the butter and fry the onion and garlic until it’s soft. If you have another pan at this time, also heat it over medium heat. Melt the butter and fry the cabbage until it has softened. When the boiling vegetables are soft, throw in the onion, garlic and cabbage. Add more water if you don't have enough stock. Simmer until everything is a soft as you like it in a soup. Stir in the mashed potatoes. Taste and add more salt and pepper as necessary. Serve. Or, if you follow the original recipe, let stand at room temperature all day or overnight; then heat and serve. Also freezes well, if you don’t have 10 – 12 people to feed immediately. I am a huge Brosch fan. When living in BC. I learned that there as many Brosch recipes as there were Doukhober communities. (all meatless) My favourite is a wedding brosch. Also according to my friend/instructor, one must always prepare everything by hand, never use a food processor. I am from the Kootenays-Kaslo-Riondel and my Mom made her borsht from a Doukhober recipe she got from a woman from Castlegar which was wonderful. The best I have ever had was from the old Grand Forks Hotel. My wife from back east loved and she has a the gift of what is a recipe by tasting it. When we got home to the coast she told me ( I am the cook) what to put in it and it was so close to the Grand Forks version. Sadly, we forgot the recipe, but yours sound so good we will make it today. I will be making homemade sourdough bread from scratch to have with it. My joke is to wave the beet over the borscht like vermouth over super dry martini. and yes to a small amount of green pepper. My mom worked for and then owned and operated Chef Garden in Grand Forks for several years in the late 90's to early 2000's, with the Borscht recipe handed down from the previous owners. We put a 1/2 cup of grated beet in, but I believe it was strictly for adding color. I moved away several years ago, and miss it terribly. I still make borscht from time to time, but nothing beats having it made with Grand Forks veggies. I received a borsht recipe years ago from a Doukhobor lady in Castlegar. It calls for lots of cream, dill, beets, cabbage etc, but also chopped sausage. Anyone else heard of putting meat in borsht? My grandmother is Doukhobor from Castlegar, and I grew up eating her borscht. 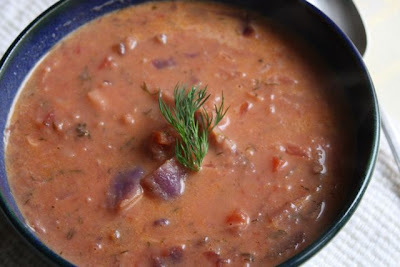 I followed this recipe last night for dinner and it tasted just like my grandmother's borscht! My parents also have a little place in Grand Forks and their neighbour is an elderly lady named Bea - a long time Grand Forks resident. The town is small enough that I bet it's the Bea mentioned on the recipe card! I added one chopped green pepper, which I remember being in some versions. 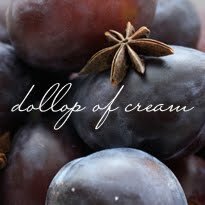 If not rich enough, I suggest serving with a dollop of sour cream. What type of potatoes do you use in the Grand Forks Doukhobor Borscht?